Yesterday all final year secondary students in the Czech Republic sat the written part of the English Maturita Exam (the word 'Maturita' comes from Latin and it is supposed to refer to the fact that students are mature enough to leave school if they provide concrete evidence - passing the Maturita Exams). When the tests were published online a couple of hours later, I immediately downloaded them so that I could go through them with my younger (less mature) students the next day (today). Unfortunately, the tests have been dumbed down recently to suit all students across the schooling system spectrum. As a result, my A2 grammar school students found the Use of English part a piece of cake and the worst result was 12/15 (even though they constantly claim that grammar is what troubles them and what they need to practise most). Needless to say, this is not good in terms of their future external motivation. 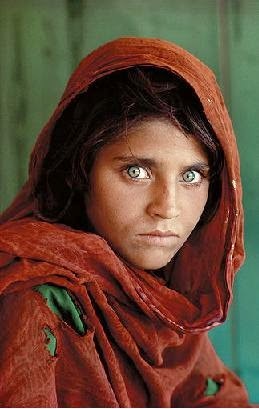 Anyway, I discovered that the Use of English part was a piece of text based on the true story of Sharbat Gula, the Afghan girl who was the subject of the famous photograph by Steve McCurry. It was a commonplace, uninteresting multiple choice gap-fill test. But I didn't mind because I had only planned to show my students what this part of the exam was like by asking them to try to do the gap-fill. I had wanted to find out what areas of lexico-grammar we need to work on. When reading the text, however, I remembered that I had seen the picture in question before and that it had a great impact on me. It occurred to me that this inauthentic (simplified) text with no visual support was actually perfect for the classroom. So I decided to exploit the seemingly boring exercise to the full. First, without any warning, I projected the famous picture on the screen. It was an advantage that none of the students had ever seen the picture before. I asked them to describe it in detail and guess what the girl's background was. At first puzzled, they eventually came up with some amazing ideas and we ended up with lots of new vocabulary on the board. Then I showed them another picture, resembling the first one, but this time there was a much older woman holding an issue of National Geographic with Sharbat Gula's face on the cover. Some thought it was the girl's mother, others guessed (correctly) that it was the same girl, many years later. Finally, I googled a picture of Steve McCurry and asked them to make connections. When I thought I had aroused their interest sufficiently, I handed out the tests. Without grumbling, they immediately started working. And I could be sure that they knew what they were reading - they weren't just filling in the gaps without thinking about the context. After checking the answers and explaining some important grammar points, we did a follow-up activity (highlighting collocations and useful phrases in the text) and I left the classroom happy, knowing that I had something meaningful for my students and that, hopefully, some learning had happened. This post was inspired by Anne Hendler's #OneThing Challenge.